It’s your third month on the job, and you’re finally starting to figure out how things work. You know who Meryl in accounting is, understand the ins and outs of your product, and know just where to park. You aren’t being taken seriously as a person or an employee. Discovering that your boss doesn’t respect your expertise can ruin your work ethic and drain your enthusiasm. But if you aren’t in a position to quit, here are a few ways to excel, even with a disrespectful boss. You don’t have to be a jerk just because your boss is. You don’t have to like them, but don’t try to go above them to their manager or spread rumors about them at the water cooler. Also stay away from complaints or insults. Regardless of how bad they are at managing you, they’re still your boss. Trying to upset that basic dynamic makes you look like the disruptive one. That could mean losing your job. Try to have an honest and polite conversation with your boss about any problems you have. It’s entirely possible your boss doesn’t even realize they’re doing a poor job of managing you. If you can alert them to any issues that exist without accusing them of anything, you might be able to turn a negative situation into a positive one. But how do you do that? If your boss refuses to value your insights, how do you address the problem without offending them? The best thing you can do in that situation is research. Back your ideas up with facts and data. If your boss says no to that, you’re dealing with a deeper problem and might want to consider rejoining the job search. This one could have gone under “Be Civil,” but it’s so important that it needs its own section. Do NOT complain about your boss or work on social media. Not even cryptic messages such as “Feeling down today…” or “People can be so awful….” Odds are that other employees, or even your manager will find these posts, and it could be grounds for termination. If your boss isn’t doing their job and continues to belittle you, you might have to become your own manager. Create a personal development plan and stick to it. Volunteer for any projects that you’re interested in. Learning new things and growing as an employee can be incredible motivators on their own. You’re also free to seek out other managers or co-workers in the office that can act as your mentors or advisors. If you can’t learn from your manager, you might as well learn from somebody else. The best way to deal with a bad boss is letting the pity party end. 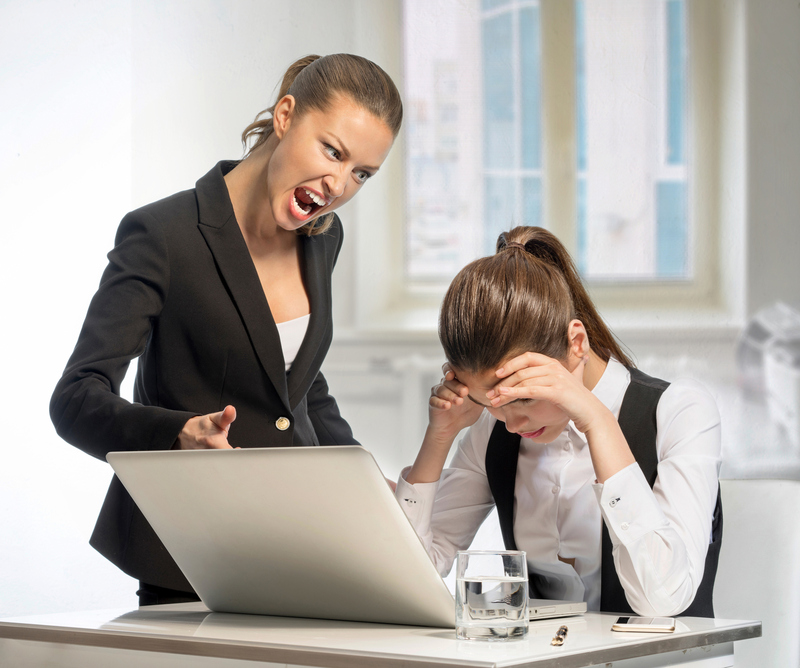 It’s completely valid to feel down or angry when you have a boss that doesn’t respect you, however, letting that feeling control your work life can be toxic. You’ll always have an excuse for why you didn’t try as hard as you could have on a project, or why it’s OK to come in late every once in a while. It can become easy to think along the lines of “if my boss doesn’t care, why should I?” That stifles growth. So let it go. Try not to hate your boss, and realize that their behavior most likely has nothing to do with you. Accept that their bad attitude is their problem, and not something that’s likely to change anytime soon. Focus on yourself and your own pursuits. And if that boss makes your life absolutely miserable, review your job and where it stands on your career path. How much longer do you need to be here? Knowing that you have an exit point can make working with a bad boss much more bearable. Ever had a bad boss? How did you deal with it? Let us know in the comments below!